This post is brought to you by Sargento®. The content and opinions expressed are always my own. 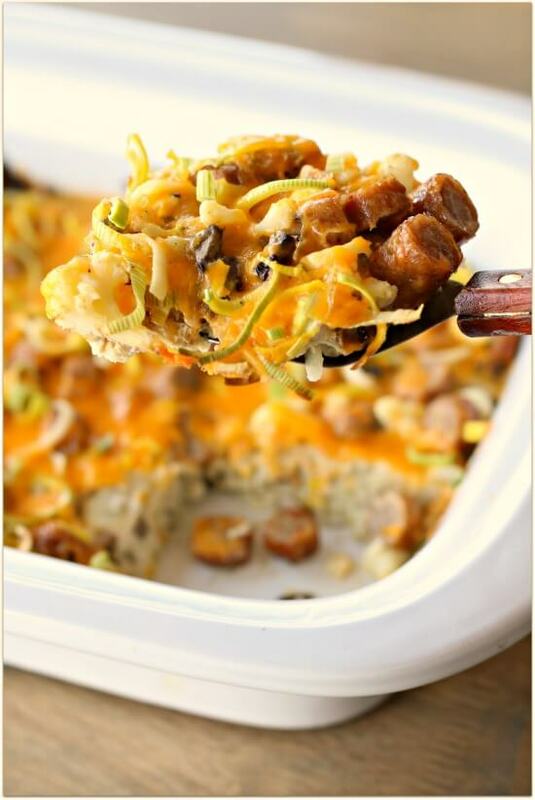 A savory, low carb breakfast casserole made in the slow cooker with eggs, cauliflower, leeks, mushrooms, sausage and shredded sharp cheddar cheese. You know what’s been fun for me and my kids lately? Watching cooking shows together! They love the Chopped Junior show and the Kids Baking Championship on the Food Network. They’ll come home from school and watch an episode or two that they have recorded. 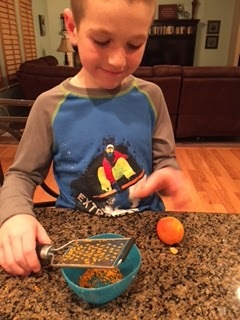 The other night my 7 year old son comes into the kitchen and gets a little grater and an orange and starts zesting an orange. When I ask him what he’s doing he tells me that he learned it from the cooking show. Um, but what are you going to do with that zest? He doesn’t know. I had a good laugh at that one. 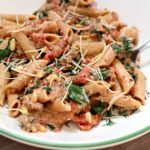 When I’m in the kitchen, sometimes I like to pretend I have to make something in a certain amount of time or with only a limited number of ingredients. It actually makes me a lot more creative to have limitations. Weird, right? Well this recipe was that way for sure. 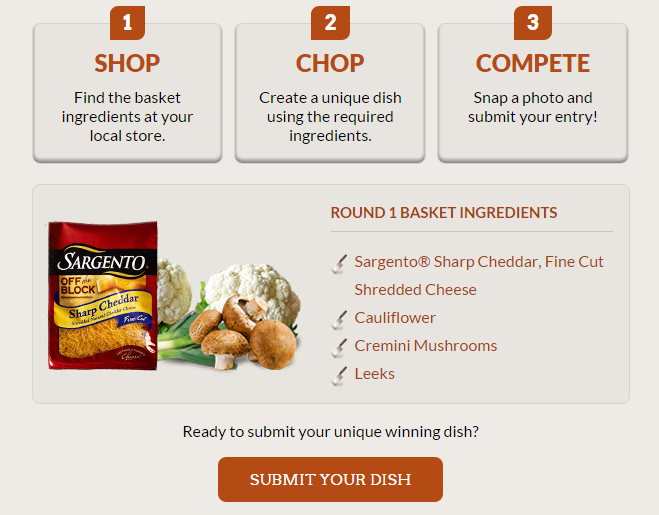 What would you make if you had to make a recipe with Sargento Cheese, cauliflower, crimini mushrooms and leeks? I played around with the idea of making some sort of soup but decided against it…I just wasn’t sure how it would turn out. Instead, I decided to make an egg casserole in the slow cooker. You could totally make this as breakfast for dinner in you wanted. I loved how the cauliflower was sort of the base of the dish. And although very healthy and low calorie, it almost took the place of the regular hashbrowns you’d typically use in a recipe like this. Of course you can’t eat a breakfast casserole without a healthy amount of cheese on top. I went with the Sargento sharp cheddar because it’s a high quality cheese that is cut from blocks of 100% real, natural cheese. 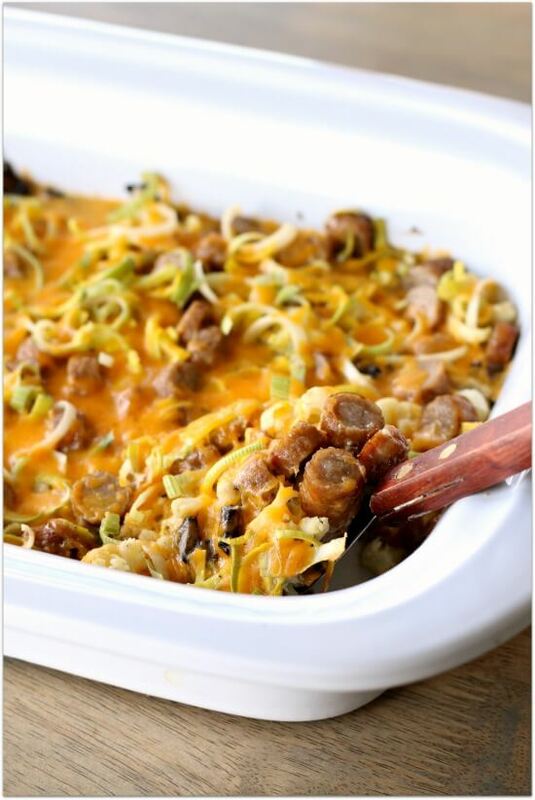 I love using sharp cheddar for recipes like this…it just adds so much more flavor than mild cheddar. I really want to know what you would make with these ingredients! Pretend you’re on Chopped, give yourself a time limit and let your imagination run while. Let me know it turns out. I also really think you should enter your recipe into the Food Network Chopped Challenge. You could with $5000 and a trip to NYC to compete in a televised Chopped cooking challenge for $10,000. Seriously, wouldn’t that be so cool? I always wonder how I would fare in a challenge like that…they never use slow cookers on those shows, so I can imagine that I would probably be the weakest link. You’re going to start this recipe off with cauliflower florets. I cut mine fairly small because I wanted them to blend into the dish instead of getting a big chunk of cauliflower when I stuck my fork in for a bite. I slightly blanched the cauliflower (in the microwave for easiness sake) and then drained it and added it to the bottom of the slow cooker. 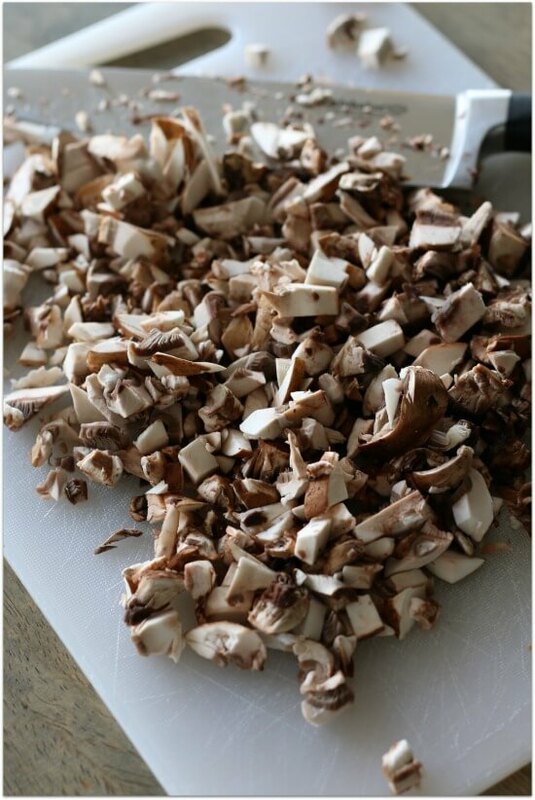 Next, finely dice the crimini mushrooms. For the same reason…I didn’t want any big chunks in the casserole. Next you’ll cut up 12 cooked sausage links into quarter inch rounds. You could probably also use browned ground sausage, if you prefer. Then you’ll clean the leeks and add them into the slow cooker. 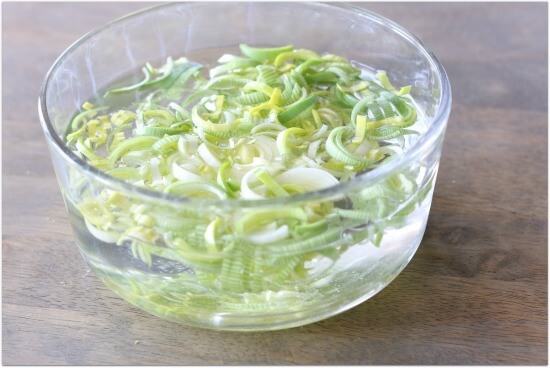 I just posted this tutorial on how to clean leeks since they are quite sandy and need more than just a quick rinse under the faucet. You’ll take the leeks and crack in some eggs and whisk that together with half of the bag of Sargento cheese. I like to add half the bag now and half at the end of the cooking time. Pour the mixture over the top and you’re ready to get cooking. 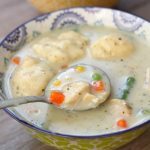 For this recipe I used my casserole crock. It is really nice for recipes like this, but not necessary. 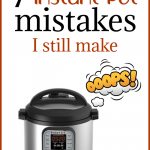 If you don’t have a casserole crock you can go ahead and just use a 6 quart slow cooker. You’ll cook on high for a few hours and then add the rest of the cheese and let it get all melty. Now serve it up and enjoy. 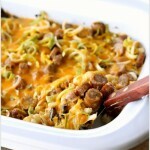 I love this casserole for dinner but it would be great for brunch as well. 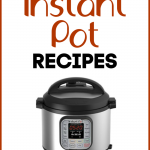 Spray the bottom of your slow cooker with nonstick cooking spray. 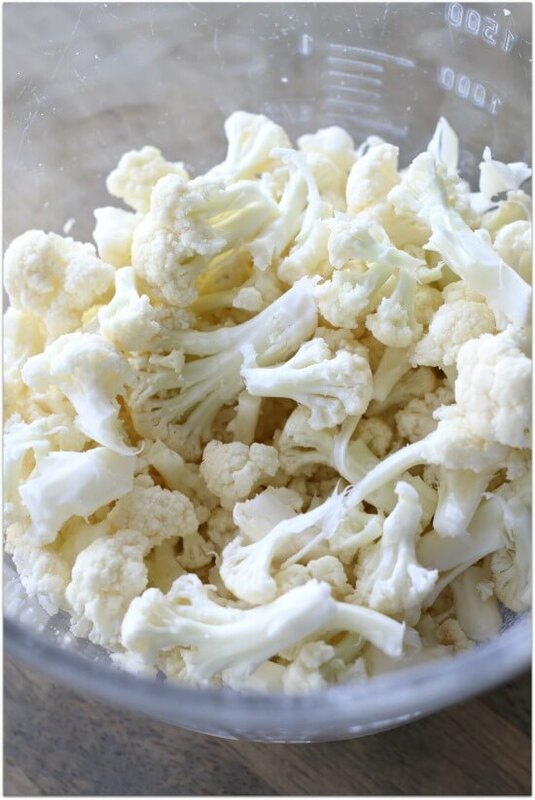 In a microwave safe bowl, add the small pieces of cauliflower (I like to cut mine it small bite-size pieces) and 1/4 tsp salt. Fill the bowl with water to cover the cauliflower. Place bowl in the microwave and microwave for 8 minutes. While the cauliflower cooks, prepare your mushrooms, sausage and leeks. Drain the water off of the cauliflower. 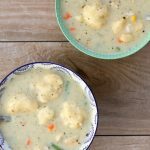 Add the barely cooked cauliflower to the bottom of the slow cooker. Uniformly distribute the mushrooms and sausage pieces. In a bowl whisk 6 eggs and 1/4 tsp salt together. Gently stir in the cleaned leeks. Gently stir in half of the bag of cheese (save the other half of the bag for later). 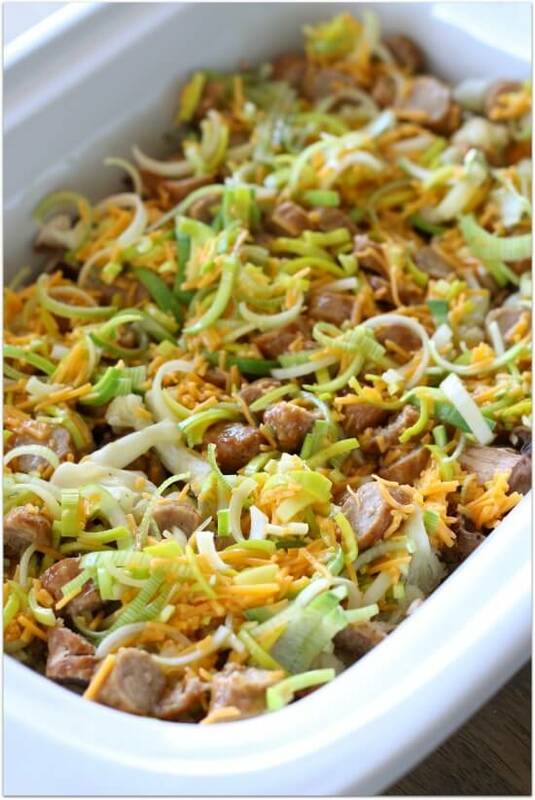 Pour the egg mixture evenly over the cauliflower pieces, mushrooms and sausage. Cover and cook on HIGH for 2-3 hours. The eggs will puff up and that’s when you’ll know they are cooked through. 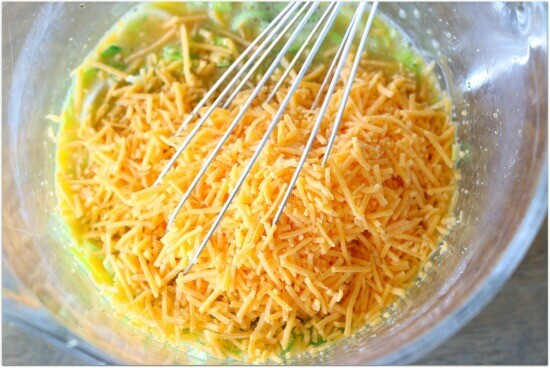 Sprinkle the remaining cheese over the top and let it melt for a few minutes. Slice the casserole and serve. Salt and pepper to taste. 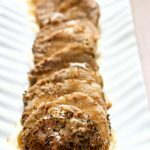 Could this recipe be done overnight on low? I think that would be too long and it would get overcooked. I’m sorry! Can this be frozen into individual servings? I’m sure you could. I haven’t tried it myself so I’m not totally sure.